Jonathan is now a doctoral candidate at Indiana University, and an undergrad at Valparaiso. His first organ teacher was former Fox Valley AGO Dean, Karl Bruhn. Let’s show him some AGO support from Fox Valley AGO members. Chuck Williamson, Fox Valley AGO member, Organist at the Holmstad. NOTE: Enter the Fabyan Parkway entrance to the complex housing the Auditorium. There is a large portico at this North entrance to the building. Walk directly south to the Auditorium. 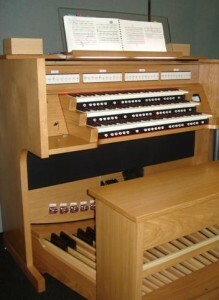 The organ is a new Rodgers 599, 3-manual, all-digital Organ.